Nose: A delicate and vibrant fruity start on the nose with peaches, apples and oranges. Tender flavours of sherry emerge with toffee, vanilla fudge and subtle marzipan. Slightly dry with hints of coffee, spiced oak and charred wood in the back. Palate: Sweet, fat and creamy on the palate with sherry, ripe fruit, oranges and liquorice. This is immediately followed by a delicate and warming spiciness of oak, cinnamon, cloves and black pepper. Bitter sweet towards the finish with orange peel, sticky plum jam, marzipan, herbal notes and a little tongue-tingling oak spice. Finish: There's more dark fruit shining through on the medium long finish with cherries, plums, marzipan and warming spiced oak. With water: Fresher and more fruits on the nose with a splash of water. The sherry is quite apparent now, nicely intermingling with vanilla, toffee and oak spice. Sweet and fruity on the palate. Delicate aromas of cherries, plums and oranges are complemented by a tamed spiciness, with a soft and lovely marzipan note towards the finish. The finish is medium long, sweet and pleasantly warm with a tender dryness of oak, nutts and cocoa on the tail. 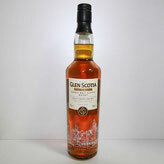 Comments: This new expression of Glen Scotia represents a very delicate and well balanced malt. A lovely mix of sweet, fruity, and woody aromas with a nice and warming spiciness. The influence of the sherry casks becomes more dominant on the palate and finish than on the nose. A delicious, slightly oily, velvety and vibrant dram. To be enjoyed either neat or with water, as a few drops bring out more dark fruity flavours. Well done folks! I thank Joe Seidel from Joe's Malt Shop for the photograph! Nose: The nose starts off with a delicate fruity aroma - oranges, red berries and papaya. Sweet with notes of sherry, nougat and lingering nutty flavours. Becomes fresher with time with a hint of red pepper in the back. 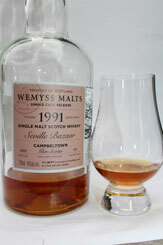 Palate: Syrupy with caramel and a delicate touch of fruity sweetness. Slightly bitter oranges followed by a massive load of pleasant spices - cinnamon, crystallised ginger, nutmeg and white pepper. Nicely dry towards the finish with dark chocolate and lingering cocoa notes. Finish: The finish is medium long and mouth-coating. Slightly oily with a wee touch of salty caramel, bitter orange, and a maritime edge on the tail. With water: There's almost no change on the nose with water. The sweetness is a bit tamed on the palate, bringing more spiciness and delicate prickling oak to the fore, accompanied by pleasant sweet sherry notes. The finish is medium long and warm, with a significant maritime and salty touch. Comments: A very delicate and pleasantly reserved dram. Very well balanced. Lingering spices intermingle with delicious sherried fruit notes and a nice touch of maritime aroma. A not overly sherried whisky which I enjoyed very much. This delicious and vibrant malt demands your full attention! Nose: Very strong on the nose. The alcohol is quite present here but not pungent at all. Behind that curtain there's delicate yellow ripe fruit coming through with apricot and some orange blossom. Slightly oily with malted barley and candied peel, along with gentle spice, white pepper and oak. Subtle briny with a whiff of camphor and lingering smoke. Palate: Rich and intense. Pleasant fruit juice with apricots and oranges and a subtle touch of bitterness, maybe pink grapefruit and lemon. This is complemented by strong spicy flavours of oak, cracked black pepper, cloves and nutmeg. The oiliness' giving a mouth coating texture. A slightly salty touch with lingering nuttiness towards the finish. Finish: The finish is medium long, smooth and sweet with sticky floral honey and a spicy dryness of pepper oak and a whiff of smoke. With water: There's more coastal notes with briny flavours on the nose, complemented by malted barley and a slightly bitter fruity aroma. Rich and intense on the palate with sweetness, delicate fruit and massive spice of pepper, oak, cloves and lingering smoke. The finish is long and warm, spicy with a coastal touch on the tail. Comments: What a lovely dram. Great fruit and sweet combination with an intensive spicy aroma. Good balance, but uncompromising. Sensuous, and deliciously lingering with a splash of water. I thank Dailydram.de for sample and photograph! Nose: The nose starts off with autumnal flavours of ripe plum and dark cherry, along with beeswax and a touch of sherry or even brandy. Polished mahogany aroma and leathery notes emerge, complimented by fragrant heather and a whiff of smoke in the background. 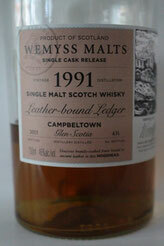 Palate: Plenty of delicate sweetness here with luscious plums and a touch of leathery and earthy flavours. Pleasant spice with nutmeg, ginger, sea salt and cinnamon arrives. Very creamy and mouth-watering with maritime notes and subtle smoke in the end. Finish: Smooth and chewy with a long finale. Deliciously lingering plums, demerara sugar and a delicate spicy dryness. Beautiful! With water: There's less fruit on the nose with more alcohol coming to the fore. Beeswax aroma is still present. It is still fruity and very sweet on the palate with delicate and hot spices, oak, pepper and crystalised ginger. The finish shows a good length with luscious ripe yellow fruit and gentle smoke. Comments: What a lovely nectar. Great fruit and spice combination with lingering leathery notes and a touch of coastal aroma. Big and bold with a fantastic balance. Another great shot from IB Wemyss!